Spelling FAIL ... perhaps this poor guy should have had his tattoo proofread before it was inked permanently. 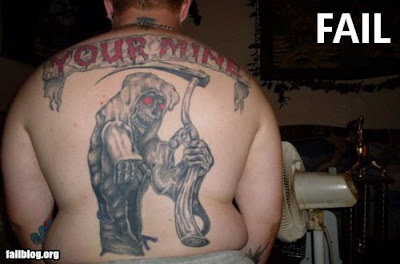 There's no going back, especially if your tattoo says "your" instead of "you're" . Fortune FAIL ... to think, this fortune cookie wouldn't have seemed so tasteless at the beginning of 2008. But fortune smiles on some. 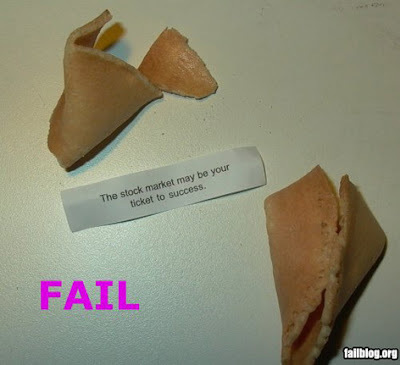 In 2005, more than 100 people shared a Powerball prize in the US after picking numbers contained in a batch of fortune cookies. 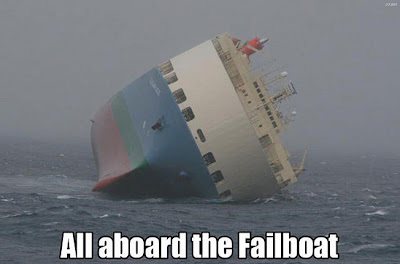 FAIL boat ... prepare to go overboard the moment you step on this ship. Even though strong winds and rough seas may have attributed to the unexpected horizontal alignment, a ship that is so easily knocked over is quite unnerving. 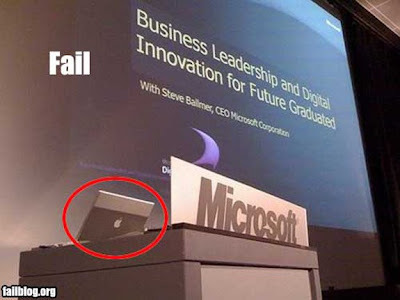 Microsoft FAIL ... here is irony at its finest — a Microsoft presentation delivered by CEO Steve Ballmer on an Apple MacBook. 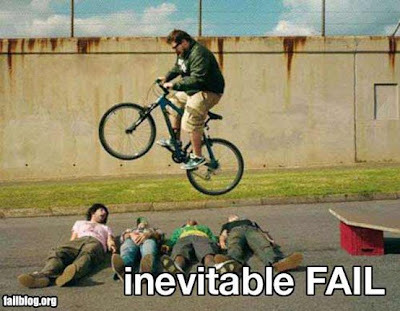 Stunt FAIL ... trust is key to any friendship, particularly if your friend wants to jump over you on a push bike. 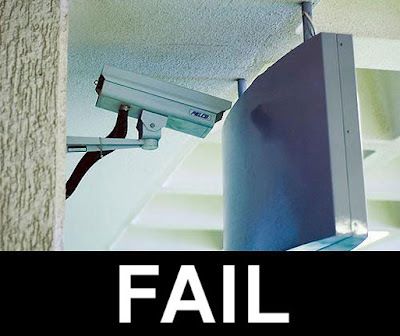 Security FAIL ... CCTV cameras can be useful when placed in strategic positions — which makes this one about as effective as a chocolate teapot. Unless, could it be... that it is a sentient X-ray camera in mischievous disguise? OMG!? SKYNET!! 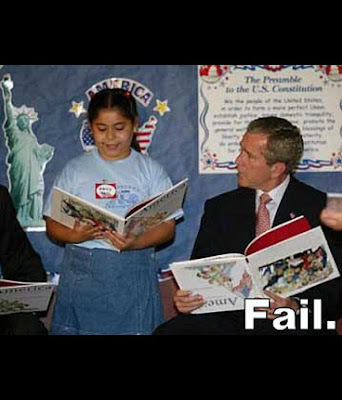 Reading FAIL ... during his eight year reign as US President, George W. Bush's slip-ups were the centre of blogger ridicule. One of them, Maddox, said Mr Bush made political satirists obsolete: "It's almost impossible to do a critical analysis because the man practically satirises himself." 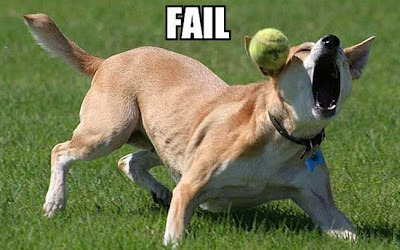 Catch FAIL ... one of the most well-known FAIL images is of a dog completely missing a tennis ball during a game of catch. The picture of the poor pooch begs the question — did the owner deliberately set his pet up for a FAIL or was the dog just unlucky? 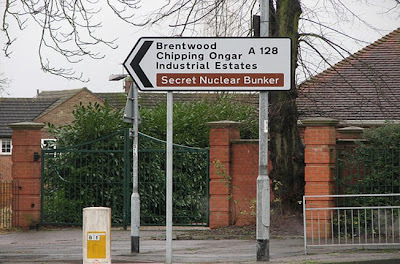 Secrecy FAIL ... this sign pointing to a "Secret Nuclear Bunker" is in plain view for everyone to see on the outskirts of London. Funny enough on first glance, however the military bunker, which can fit up to 600 military and civilian personnel, is actually a tourist attraction. 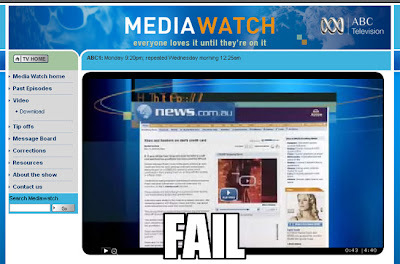 News FAIL ... nobody's perfect, including us. Somehow it just didn't seem right to poke fun at everyone else without including one of our own stuff-ups. The Stunt Fail is great!